Teen Patti is a card game, which can have seasoned gamblers salivating at the mouth. Even casual players who may just indulge in a couple of rounds at Diwali or New Year love the excitement. With such a title and Amitabh Bachchan in the lead role, one would have thought the producers have a sure shot winner on their hands. One of the most popular moves in Teen Patti is 'Blind'. But here, it seems director Leena Yadav was moving blindly in all directions. Amitabh Bachchan (Venkat Subramanium) is an unsuccessful Maths professor whose superiors claim his research projects have no practical applications. But his latest is a dissertation on the Theory of Probability which can help them predict the winner in a card game and earn megabucks in the process. So the tutor and his bunch of students are encouraged to take a shot at implementing the theory in the real world. And then all hell breaks loose. The students, who started out as middle-class simpletons, turn into raving lunatics overnight. They come and go as they please, stash hundreds of rupees in their hostel rooms and get hysterical. The script doesn't evolve, it just jumps jerkily from one level to another so that the director can take her story to a predictable end. Such a pity because co-writer Shiv Subramaniam has written such brilliant films like Parinda and Hazaaron Khwaishen Aisi. It's getting tiring watching R Madhavan doing young man roles. He hasn't lost his acting abilities but he really needs to rid himself of his flab. The energy and zest that the actor used to bring on screen -- especially seen in Guru -- is missing. After The Last Lear, it was just a matter of time before somebody tried to recreate a similar persona for Amitabh Bachchan. But the consistency is missing here. 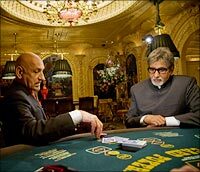 Bachchan does his best but he's tied down with a clichéd script. Also, his costumes don't make him look like a millionaire, who can afford to lose lakhs of rupees in one night. In a few scenes, he is seen wearing a white shirt and coat, and looks straight out of Cheeni Kum. The script is not the only place where the clichés abound. The underground gambling dens are garish and look straight out of Dev D. The high-profile parties and casinos look even more bizarre. It's apparent they were trying to create a Las Vegas kind of effect but it just doesn't work. Shakti Kapoor was the fun part of the film. He's called Prem London, a loud-mouthed compulsive gambler. His dialogues are full of expletives. His daughter Shraddha makes her debut in the film as Aparna. Though a bit raw, she has a lot of potential. In fact, it is the acting prowess of the ensemble cast that gets you involved. Newcomers Dhruv Ganesh, Siddharth Kher and Vaibhav Talwar show great promise. This is one aspect where Leena Yadav has really delivered the goods. Three decades after Gandhi, Ben Kingsley still weaves magic for the Indian audiences. As Kingsley and Bachchan share their life experiences, there is the sheer pleasure of watching two legends share screen space. And since there is no attempt to overshadow the other, the experience is memorable. It's difficult to visualise other actors in these roles. Teen Patti is worth a watch just for the actors.